“Signed, Sealed, Delivered” was the theme of the 2013 National Catholic Youth Conference held from Nov. 21-23 in the Indiana Convention Center and Lucas Oil Stadium in Indianapolis. On the morning of Nov. 23, the 23,000 youths from across the country who participated in the conference reflected on and prayed about the “signed” part of that theme and its relationship to baptism during a general session held in Lucas Oil Stadium. Bob Herron, director of youth and young adult ministry for the Diocese of Wheeling-Charleston, W. Va., spoke about how those who are baptized are adopted children of God and that, together, they form God’s family. Herron spoke about this belief out of his experience as the father of three adopted children. At one point, he asked those in the audience who had been adopted to stand up. Then he explained how everyone who has been baptized has been adopted by God. Everyone in the stadium stood up and thundered their applause. 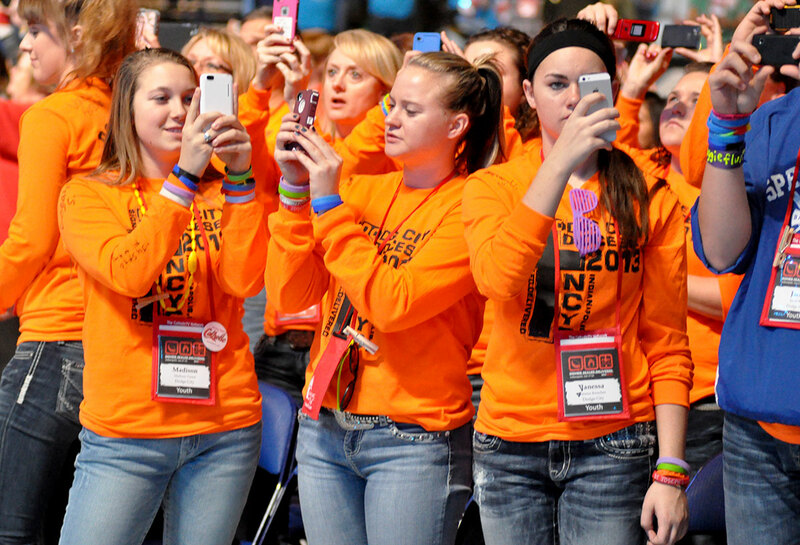 To help them appreciate their being a part of God’s family and to share that good news with others, Herron had conference participants take out their cell phones, take a picture of the tens of thousands that filled the stadium and then post it to social media. Later, Herron reflected on how God’s family is enriched by the talents of each of its members. Herron also challenged the teenagers to reach out in love and support to their adopted brothers and sisters who might be picked on or bullied in their schools or in other settings. He invited the audience to pause and think of one person in that situation that they know. “Think of that person,” Herron said. “When we become part of God’s adopted family and become a son and a daughter, we are called to love. I believe this. When Jesus died on that cross, he died for my sins. When he died on that cross, he died for your sins. And guess what, young Church—when he died on that cross, he died for that person that you were just thinking about now. Finally, Herron shared the story of his father who struggled with Lou Gehrig’s disease for years. Shortly before he died, the father shared an important life lesson with his son. “He looked at me and said, ‘Bob, if I’ve learned anything through my dying it’s this: You cannot repay love. You only pass it on,’ ” Herron said. “My challenge to you, young Church, is to share that love with one another here and when you go home. The Nov. 22 morning session in Lucas Oil Stadium ended with a prayer service led by Bishop Mark L. Bartchak of the Diocese of Altoona-Johnstown, Pa. It featured bishops attending the conference going throughout the stadium and blessing the conference’s participants with holy water as a reminder of their baptism. “I love the communion of saints,” Bishop Bartchak said. “Not only the ones that are in heaven. But I’m looking around this place today, seeing that we are filled in this place with living saints.